Courtesy of That Food Cray !!! In this debut capsule collection from two food and travel bloggers, colorful hand-drawn foods meet clever pop-culture puns. Food and fashion are colliding once again with this new line between bloggers That Food Cray !!! and Urban Outfitters. When Taco Bell announced late last month that it was partnering with Forever 21, it got a bit of a mixed reaction. They were hardly the first restaurant or food franchise to dip their toes into the realm of clothing. While both KFC and McDonald's had delivered their own signature spin on fashion-based branding, some felt it was more novelty than necessary, (re)begging the question: Food can be visually appealing, but can it be fashionable? This time around, Philadelphia-based multinational clothing company Urban Outfitters and That Food Cray !! !, an Instagram account turned travel and lifestyle media platform, have teamed up to release a line of graphic tees and accessories that cleverly highlight our favorite cultural references and cuisine. Drawing from That Food Cray !!! 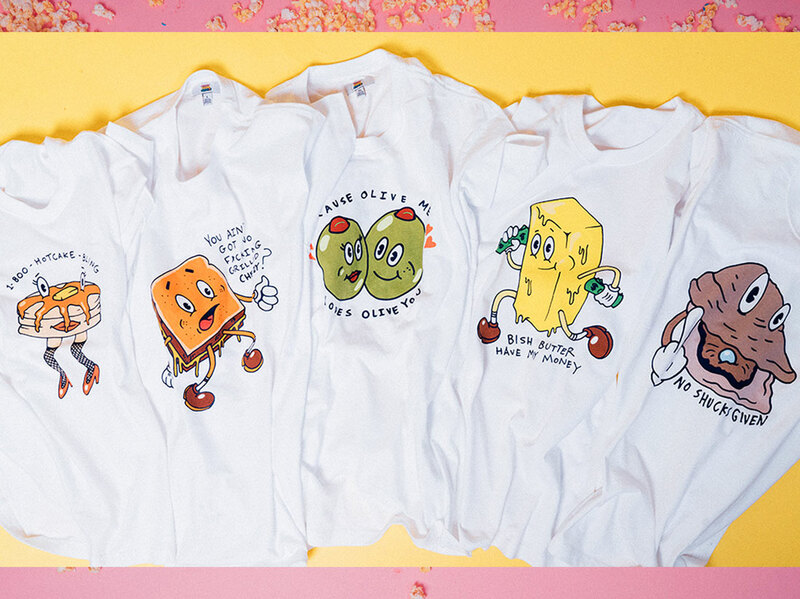 's popping visuals, love of food, and appreciation for music (particularly Hip-Hop), the collection includes five different graphic t-shirts with a unisex fit and one tote-bag, all of which featuring various hand-drawn anthropomorphic foods and funny musical puns or That Food Cray !!! 's signature logo. Foods like butter, olives, and oysters are drawn in a retro-style, and each shirt's aesthetic offers attitude—right in line with the creative tone of That Food Cray !!! 's creators, Nicole Fung and Eugene Kan. From the endearing "'Cause Olive of Me Loves Olive You" and the punny Rihanna reference "Bish Butter Have My Money" to the Drake-inspired "1-800-Hotcake-Bling" and the less than subtle "No Shucks Given," there's probably a graphic tee to match your mood. Meanwhile, the lone tote in this capsule collection takes a more traditional branding route by featuring That Food Cray !!! 's vibrant, eye-catching logo. The tole is available for $29, while all of the tees are priced at $34. You can pick up your own online at UrbanOutfitters.com or in North American stores.